Steeda's Ultimate Induction Power Pack is a complete performance package that includes Steeda's Cold Air Intake with High Flow Inlet Elbow and SCT Tuner. Steeda's Cold Air Kit for the GT500 produces the greatest gains of any cold air kit on the market. Testing has shown increases of up to 97 HP to the rear wheels! The kit is supplied with a stainless steel air box with built-in Billet Super Velocity Stack. Steeda's velocity stack helps to increase air flow by smoothing out incoming air. Steeda's Cold Air Kit mounts in the factory location with the supplied rubber trim to keep the hot air out. This Cold Air Kit also offers the largest mass air meter on the market at over 114 mm! Our tests showed inlet temps a mere 5-10 degrees above ambient temperature. The Steeda Lifetime Filter can easily be cleaned and re-oiled, making maintenance a snap. All stainless steel hardware required for installation is included in the kit. Used by the top tuners in the industry. We have streamlined the airflow in the GT 500 Mustang to the point that a computer re-flash isn't just an option, it's required! The SCT XCalibrator 4 is the perfect tool for the job and included in this kit. Since Steeda has done all the testing and tuning for you, drivability is as good as stock except when you hammer the throttle! Note: Please provide your vehicle's 4-digit processor code when placing your order to receive the proper tuning. Lifetime Tune Program: Purchasing this Steeda Power Package automatically registers you into Steeda's Lifetime Tune Program, at no extra cost! 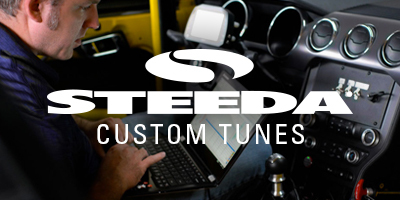 To learn more about Steeda's Lifetime Tune Program, click here. Note: Federal and several state and provincial laws prohibit the removal, modification or rendering inoperative of any part that affects emissions or safety on motor vehicles used on public streets or highways. Steeda Autosports assumes no liability for any violations arising out of any federal, state or provincial emissions or safety requirements on motor vehicles arising out of the customer's modifications and/or use of Steeda products. It is the responsibility of the customer to determine if their modified vehicle complies with applicable laws. I have ran this kit on my 2007 GT500 convertible for the past 5 years and put over 25,000 miles on the car with it. I have driven fast cars my whole life and the car stock did not really excite me. Yes, it had 500 HP stock, but it also weighs around 4,000 lbs. With this CAI and Tuner package the car really comes alive. At any speed, in any gear, and any throttle position the difference in the car is obvious. At full throttle the car is amazing. I have taken my car to the track and have seen about a .4 -.5 second improvement in my 1/4 times with this mod alone and did not push the car hard to see that. I have road tripped the car and been fine on 91 octane when that is all I could find. I have also switched gears later on and was easily able to change my tune to adjust for it. I had one small issue that was probably self caused after 3 year and Steeda helped me with no problem and no charge. My only complaint is that I found the car runs a little smoother after this mod when I up my idle 100 rpms, but that is easy to change. The GT500 is already a beast, and these upgrades made it even faster!